Corrugated cardboard banding, applied to the trunks of host trees, works as a trap for mature codling moth larvae as they crawl on the tree in search of a place to pupate. SIR Program staff band residential host trees primarily in areas near orchards. The bands are typically left in place until the end of the growing season, at which time staff remove the banding and determine how many codling moth larvae (if any) are present. Banding is a useful tool that can aid in assessing the level of wild codling moth presence in particular trees. SIR Program staff also use banding in orchards where codling moth infestations have been identified (priority orchards). Bands are placed on trees in areas of the orchard which have high levels of infestations. Bands will be left in place until the end of the growing season, at which time staff remove the banding and determine how many codling moth larvae (if any) are present. Cardboard banding can also provide some supplemental control of the codling moth, during the growing season, particularly if the banding is changed (remove and destroy existing band, and replace it) during the growing season. 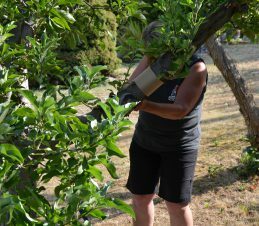 Organic orchardists may choose to use cardboard banding. See our Organic Orchard section for more information. Banding should be applied by early June (corrugated side of the cardboard toward the tree), then removed, destroyed, and replaced in mid-July. The second bands should then be removed and destroyed during late fall or over the winter. It is important to understand the limitations of banding as a control method. 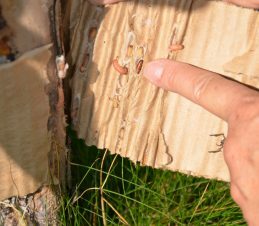 Banding will only capture a small portion of the codling moth present on a tree; and banding only captures codling moth larvae after they have infested the fruit on the tree.